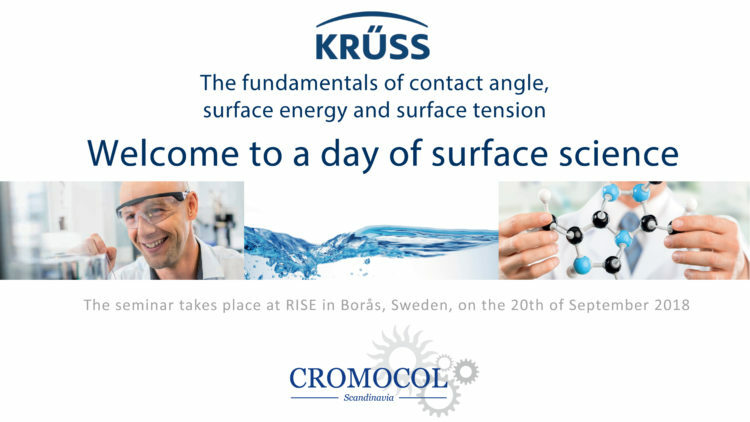 On the 20th of September it is once again time for us to host another seminar in the field of contact angle and surface chemistry analysis together with Krüss GmbH. This time the seminar will take place at RISE in Borås. It will contain a full day of theoretical presentations, applications and practical demonstrations. Please see the invitation below for more information. We will only be able to host a limited number of visitors and the deadline for registration is the 14th of September. Please don’t hesitate to contact me if you have any questions and I hope to see you there. Offering excellent quality since 1945. Cromocol Scandinavia AB is company with focus on test equipment, instruments and systems for quality control and testing of materials and components. The products we market are from world leading manufacturers, renowned for its quality and technical innovation. Our customers are mainly based in Scandinavian but also in a few neighbor countries.